This series of articles covers everything Graf Orlok and is designed to be read sequentially. They detail the film’s history, many different versions and home video releases, and I suggest you start reading from Part 1, unless you want to skip straight to the DVD and Blu-ray reviews. As we’ve seen, the most recent 1987, 1995 and 2006 restorations are the only complete versions available. Aside from a few tiny missing snippets, they all return the film to its original length. They’re each quite distinct, but strangely the latest does not advance upon the earlier ones in every area, as you might presume. It’s very much a case of six of one, half a dozen of the other. It’s crucial to bear in mind that no new early prints of Nosferatu have surfaced since 1984 and none of the three restorations since then is intrinsically ‘better’ than the others. Simply put, they’re each a very different patchwork, but all draw on the same handful of incomplete, variable quality prints. Vastly different tinting schemes, including the hues, placement and timing of colours. Additionally, each makes several errors unique to that version. Some shots look better in one or the other and sometimes either can have more information in the frame, according to the source used. They contain three different editing goofs between them, with snippets of repeated footage. Each has multiple instances of missing frames that are present in the other. They’re mostly fleeting transitions and scene extensions, but it’s clear no one version incorporates every scrap of available footage. There are some variances in the exact placement of intertitles and neither seems to get it completely right. Their designs vary too; slightly between each restoration and greatly between the many different home video editions, with six distinct sets altogether. Last but not least, there are the scores: a total of six very different ones across all the restored discs. The BFI’s orchestral opus by James Bernard is the pick of the bunch but they’re all pretty fab. You could easily collect the whole set. I did. The bottom line is that neither is technically or subjectively ‘better’ than the other. Everyone will have their own preference. I’ve noticed a strong tendency for fans to prefer the 2006 restoration, but believe confirmation bias plays a part in thinking the latest must be the best. It ain’t necessarily so. It does look gorgeous but is mainly compromised by having the most variable score and some strange tinting choices. One thing’s for sure: even allowing for the subpar state of extant materials, none of the restorations are anywhere close to perfect. There’s room for much further improvement and given Count Orlok’s undying popularity (pun wholly intended), one day it’s bound to happen. 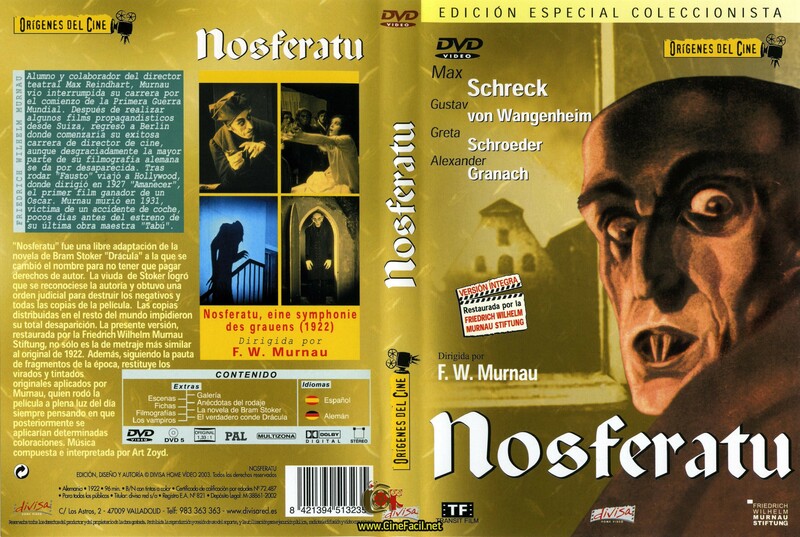 The number of low quality Nosferatu DVDs featuring the “public domain version” easily runs into the hundreds, but here are all known restored releases, including VHS tapes and LaserDiscs for good measure. They range from the very good to the sublime and all have custom recorded scores and varying amounts of extra features. If it’s not on this list, don’t buy it; if you already have, replace it. DVD recommendations: for the earlier restorations, the unique UK Eureka (2000), US Image (2000) and Kino (2002) discs are the pick of the bunch. A big fan of the film would own all three, for their different restorations, scores and extras. For the 2006 restoration, Eureka’s 2-DVD reissue (2013) and all Spanish (but non-English friendly) sets come out tops. Every restored release has been transferred at 18fps, bar the BFIs at 19fps. 2006 restoration – all 94–95min (incl. 2min+ of restoration credits) and with Erdmann/Heller score. All have original German intertitles but the 2-disc Kino and Madman sets also have a fifth set of new English ones! The Kinos have the German on a separate transfer on the second disc, while the Madman defaults to them on the first disc, with the English as optional. Though I own various other copies of the film, the mainstays of my collection are the BFI and Eureka MoC BDs, the 2000 Eureka and Image DVDs, and the 2002 Kino DVD. To that you can add Elite’s DVD of the Atlas Film version. Between them they have a total of seven scores and six completely different transfers – seven if you count both the BFI’s and Kino’s versions of the 1995 restoration, with their different intertitles and framerates. For my own viewing I usually rotate between all of them, but when screening the film for others, the BFI BD is my go-to disc. A note of caution: Transit Film, licensees of the 1987 and 1995 restorations, sent out the wrong masters to the BFI and Eureka when they requested PAL copies of the 1995 for VHS and DVD release. The BFI got the right version, but an NTSC copy instead. This created issues when they mastered directly from NTSC-PAL, so consequently the BFI DVD has by far the softest transfer of the lot. By rights they should have reissued it 13 years later, when the Photoplay version was rescanned and cleaned up to create a new HD master. A real pity, as it’s the only one with James Bernard’s brilliant score. If you want to hear it, you may be better off sticking to the album or the BFI’s (almost) problem-free HD copy on BD or digital. Luckily for completists, Eureka fared even worse by Transit and received a digital B&W copy of the otherwise-unissued 1987 restoration. But it was also in NTSC, so as I said earlier, Eureka commissioned extra work on their copy to minimise the effects of the unconverted transfer. Therefore the results are much better than you usually see in such cases. All Kino DVDs have similarly afflicted PAL-NTSC transfers, but that’s as a result of cost-cutting on their part. In addition to the numerous bargain bin copies of the “public domain version”, there are various illicit copies of the licensed versions – obviously all should be avoided. For example, the 1995 restoration was pirated on a couple of cropped, vertically-stretched French DVDs by inveterate crooks Films sans Frontières. Though one is packaged as “Collection Ciné Club”, both discs are identical. A DVD from Gryphon Entertainment in Oz has an uncredited rip of the 2006 restoration, with the 5.1 surround score incorrectly transferred in mono. Amateurs. Gryphon’s “version” has been reissued on the latest pirate, a 2017 DVD from shysters Bounty Films. There are also several pirated DVDs and even reputed BDs from Italy, courtesy of prolific thieves Ermitage Cinema and Studio 4K. Shun them like the plague: Italy still has no legitimate Nosferatu releases as a direct result of their piracy. It’s hard to imagine that for so many years, starting from its peak première presentation, Nosferatu gradually all but disappeared and could only be seen by a tiny minority in awful, incomplete B&W versions, usually devoid of any score whatsoever. This sorry state of affairs began to turn around in the mid-1960s, with the arrival of the pivotal Atlas Film version. Things improved steadily until today when, as with so many other silents, we are spoiled by a veritable cornucopia of choices. Whether on any of the complete and restored, high quality home video editions above or the constant stream of screenings with live music, we never need return to those dark days of yesteryear. I won’t ever tire of saying this: in terms of accessibility, there’s never been a better time to be a silent film fan and this really is the new golden age of cinema. Sweet dreams!